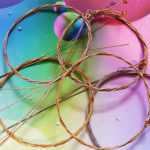 Pendant out of Lyle’s strings is app. 2 1/2″ and comes with a glass bead. 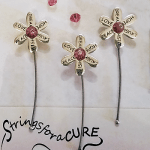 Designed by jeweler and 2x breast cancer survivor Elisa Guida. Comes with a 16, 18, 20, 22 or 24″ leather chord with lobster clasp. 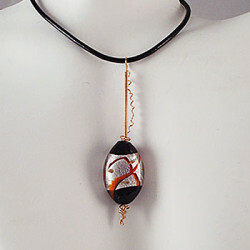 This piece is made to order and takes approximately 6-8 weeks to complete. These pieces are hand made and may vary slightly. Lyle Lovett was one of the most distinctive and original singer/songwriters to emerge during the ’80s. Though he was initially labeled as a country singer, the tag never quite fit him. Lovett had more in common with ’70s singer/songwriters like Guy Clark, Jesse Winchester, Randy Newman, and Townes Van Zandt, combining a talent for incisive, witty lyrical detail with an eclectic array of music, ranging from country and folk to big-band swing and traditional pop. Lovett‘s literate, multi-layered songs stood out among the formulaic Nashville hit singles of the late ’80s as well as the new traditionalists who were beginning to take over country music. Drawing from alternative country and rock fans, Lovett quickly built up a cult following which began to spill over into the mainstream with his second album, 1988’s Pontiac. Following Pontiac, his country audience declined, but his reputation as a songwriter and musician continued to grow, and he sustained a dedicated cult following throughout the ’90s.Born in Klein, Texas — a small town named after his great-grandfather, a Bavarian weaver called Adam Klein, which later became a Houston suburb — Lovett was raised on his family horse ranch. He didn’t begin his musical career until he began writing songs while he attended Texas A&M University in the late ’70s, where he studied journalism and German. While he was a student, he performed covers and original songs at local folk festivals and clubs. As a graduate student, he traveled to Germany to study and continued to write and play while he was in Europe. However, he didn’t begin to pursue a musical career in earnest until he returned to America in the early ’80s. Upon his return to the States, Lovett played clubs throughout Texas, eventually landing a spot in the 1983 Mickey Rooney TV movie Bill: On His Own. The following year Nanci Griffith, whom Lyle had interviewed for a school paper while he was in college, recorded his “If I Were the Woman You Wanted” on her Once in a Very Blue Moon album. He also sang on the album as well as her 1985 record Last of the True Believers. Guy Clark heard a demo tape of Lovett‘s songs in 1984 and directed it toward Tony Brown of MCA Records. 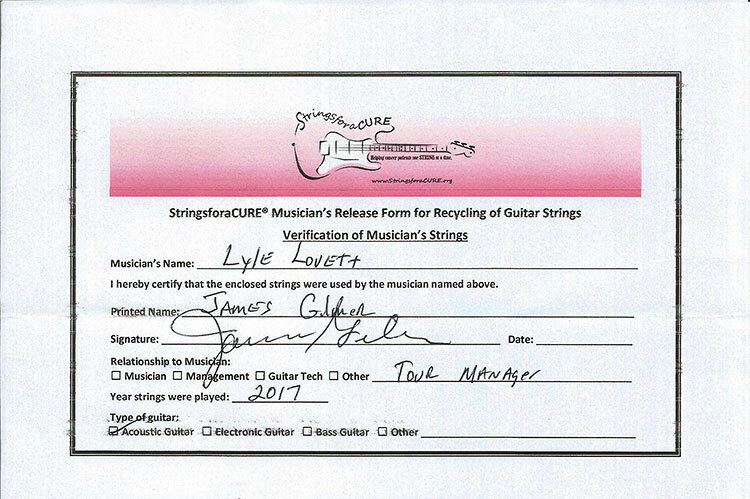 Over the next year, MCA worked out the details of a record contract with Lyle. In the meantime, he made his first recorded appearance on Fast Folk Magazine, Vol. 2 #8 later in the year. Lovett signed with MCA/Curb in 1986, releasing his eponymous debut later in the year. Lyle Lovett received excellent reviews, and five of its singles — “Farther Down the Line,” the Top Ten “Cowboy Man,” “God Will,” “Why I Don’t Know,” and “Give Back My Heart” — reached the country Top 40. Despite his strong showing on the country charts, it was clear from the outset that Lovett‘s musical tastes didn’t rely on country, though the genre provided the foundation of his sound. Instead, he incorporated jazz, folk, and pop into a country framework, pushing the musical boundaries of each genre. Pontiac, his second album, revealed exactly how eclectic and literate Lovett was. Greeted with overwhelmingly positive reviews from both country and mainstream publications upon its 1987 release, Pontiac expanded his audience in the pop and rock markets. The album charted in the lower reaches of the pop charts and slowly worked its way toward gold status. While his pop audience grew, his country fan base began to shrink — “She’s No Lady” and “I Loved You Yesterday” both made the Top 30, but after those two songs, none of his other singles cracked the country Top 40. It didn’t matter that Lovett‘s country audience was disappearing — Pontiac had gained enough new fans in the pop mainstream to guarantee him a strong cult following. To support Pontiac, he assembled His Large Band, which was a modified big band complete with guitars, a cellist, a pianist, horns, and a gospel-trained backup singer named Francine Reed. Lovett recorded his third album, Lyle Lovett and His Large Band, with his touring band. Like its two predecessors, the album was well-received critically upon its early 1989 release, and it performed well commercially, peaking at number 62 and eventually going gold. Perhaps because of the album’s eclectic, jazzy sound, the album produced only one minor country hit in “I Married Her Just Because She Looks Like You,” but his straight rendition of Tammy Wynette‘s “Stand by Your Man” received a great deal of attention in the media. Following the release of His Large Band, Lovett settled out in California, which signaled that he was abandoning country. After settling in Los Angeles, he spent the next two years collaborating and working on his fourth album. In 1990, he produced Walter Hyatt‘s King Tears album; the following year, he sang on Leo Kottke‘s Great Big Boy and donated a cover of “Friend of the Devil” to the Grateful Dead tribute album Deadicated. Also in 1991, he made his acting debut in Robert Altman‘s The Player, which was released in the spring of 1992. A few months after The Player hit the theaters, Lovett‘s fourth album, Joshua Judges Ruth, was released. Boasting a heavy gospel and R&B influence, Joshua Judges Ruth was his most successful album to date, peaking at number 57 and going gold. On the whole, the album was ignored by country radio, but pop audiences embraced the record, and Lovett became a staple on adult alternative radio and VH1. Despite the success of Joshua Judges Ruth, Lovett became a near-superstar for a completely different reason in 1993 — his surprise marriage to actress Julia Roberts. Upon the announcement of their marriage, Lovett became the subject of many gossip segments and tabloid stories, elevating him to a level of fame he had not experienced before. Lyle‘s first project after his marriage was a role in Altman‘s 1993 film Short Cuts. He didn’t release another album until the fall of 1994, when I Love Everybody hit the stores. A collection of songs Lovett wrote in the late ’70s and early ’80s, I Love Everybody continued his move away from country, and it was the first record he had released that didn’t expand his audience in some way. After it entered the charts at number 26, it disappeared 13 weeks later, failing to go gold. Lovett and Roberts divorced in the spring of 1995, and Lyle began to retreat from the spotlight somewhat, spending the remainder of the year touring and writing. Lovett re-emerged with The Road to Ensenada, the first album since Pontiac to be dominated by country songs, in the summer of 1996. In addition to performing well on the pop charts, where it entered at a career peak of number 24, The Road to Ensenada performed strongly on the country charts, entering at number four. The two-disc covers album Step Inside This House followed in 1998, featuring mostly underexposed material penned by some of Lovett‘s favorite songwriters (many of whom hailed from Texas). In 1999, Lovett issued his first concert record, Live in Texas, and his soundtrack to the Altman film Dr. T. & the Women followed a year later. Smile, a collection of songs recorded for various movie soundtracks, appeared in 2003, followed that same year by My Baby Don’t Tolerate on Lost Highway. The label also released It’s Not Big It’s Large in 2007 and Natural Forces in 2009. A holiday EP, Songs for the Season, appeared in 2011, and a couple of tracks from it ended up on Release Me, Lovett‘s final album on his Curb Records contract, which appeared in 2012.